Of all the worries drivers encounter--slick roads, motorists on cell phones, traffic light runners and more--add a new category to the list. Sinkholes have gone from rare oddity to recurring phenomenon in our urban landscape. Sudden failures of North American roadways are on the rise and range from benign inconvenience to deadly catastrophe. 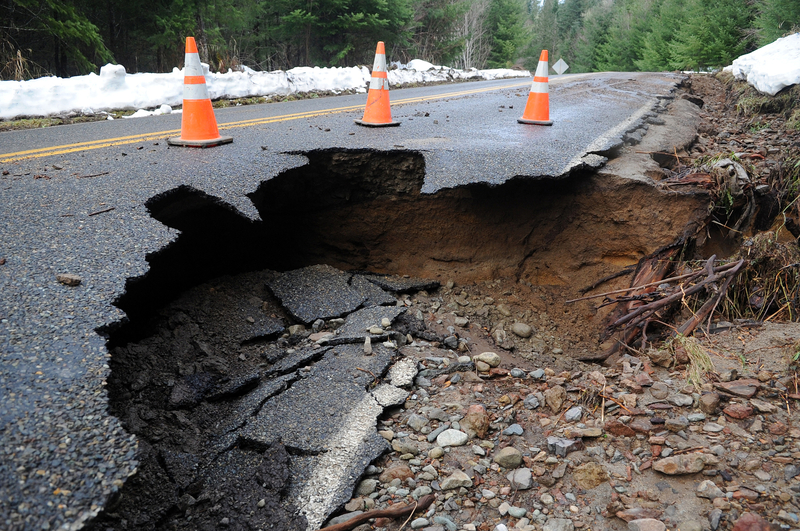 Similar to flash-floods, a sinkhole can occur when a heavy rain falls after a prolonged dry period. "Once those caves start to collapse, the materials above will simply funnel in," says Dr. Anthony Cooper, a principal geologist at the British Geological Survey. A water main break led to a sinkhole and some flooding on Fredericks Street in San Luis Obispo on Friday afternoon. Emergency crews diverted much of the water away from neary residences, though some yards took on water. No significant property damage was reported. The BGS maps the country for rock types susceptible to sinkholes and carries out surveys for developers, builders and individuals worried about the prospects of the land caving in beneath them. "It's just like an egg timer, really,” Cooper said, regarding the formation of sinkholes. Some areas are more prone to sinkholes. Data from the United States Geological Survey shows Michigan is one state in particular with a high concentration of sinkholes. The morning of Christmas Eve 2016, saw the Fraser sinkhole emerge in suburban Detroit. This 100-foot-wide, 250-foot-long crater affecting 22 homes displaced scores of residents. Crews point to a leaking pipe as the culprit. This latest incident represents the fourth time in 35 years that this particular pipe--the 15 Mile Interceptor Line--has caused a sinkhole. -Sinkholes happen after water intrudes into an area of easily dissolved rock and cannot escape. More specifically, water absorbs carbon dioxide and becomes more acidic as it seeps through the soil. -Roughly one-third of the ground beneath North America possesses the capability to suffer a sinkhole. -Check regional maps provided by the USGS to see what risk factors are associated with your area. -Look for signs that the ground is weakening, like sagging trees and fence posts.